Something about Fall makes me want to put pumpkin in everything. 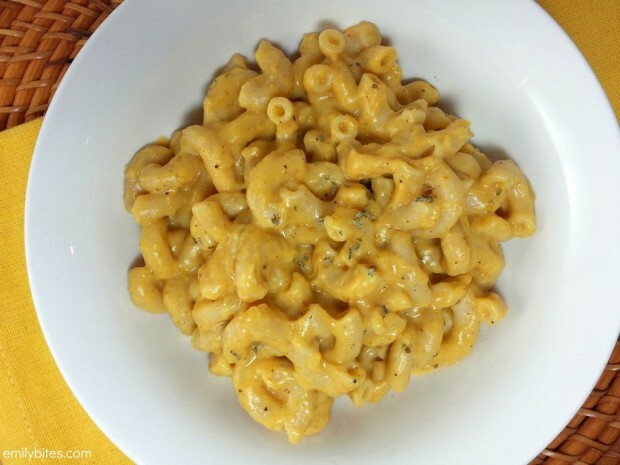 I’ve seen pumpkin mac & cheese around lately in restaurants and on other blogs, so I decided to take a crack at my own recipe for it. I already knew pumpkin and pasta work well together from the Sausage & Pumpkin Pasta I’ve made in the past, so while it may sound strange to some I was already on board. The first thing you need to know is that adding pumpkin to a roux or cheese sauce will automatically give it the richest, creamiest texture you could ever hope to achieve without loading it up with fat. It’s actually kind of amazing. I used mustard powder and nutmeg to season Stovetop Mac & Cheese in the past, so those sounded good again and I also decided to add rubbed sage since it worked so well in the Sausage & Pumpkin Pasta. I also initially tried to make this with goat cheese (because I love it so much) but unfortunately it wasn’t a great match for the dish and the flavor seemed off. Replacing it with sharp cheddar gave it the perfect balance between pumpkin and cheese. This dish is warm, comforting, decadent, creamy, rich and perfect for Fall. I recommend sprinkling a little dash of Pumpkin Pie Spice on your serving before eating it because it enhances the pumpkin-y Autumn flavors even more. Don’t be alarmed, Pumpkin Pie Spice is not sweet and will not interfere with this being a savory dish. 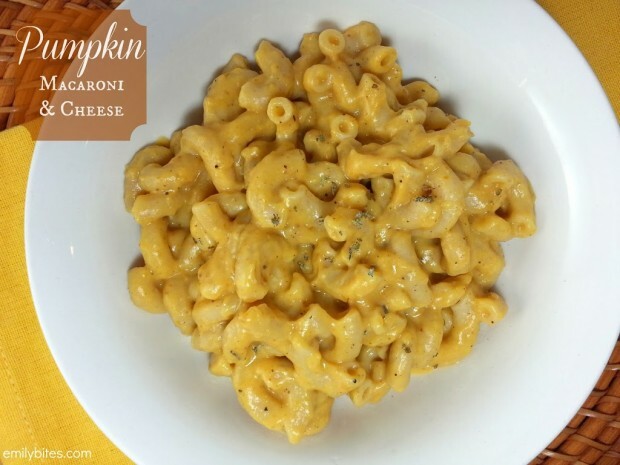 If you love mac and cheese and you’re looking for a fun flavor twist for Fall, this dish is for you! Bring water to boil in a large pot and cook pasta according to package directions. Drain and return the past to the pot. While step one is happening, melt the butter over low heat in a medium saucepan. When butter is melted, add flour and stir together for about one minute. Add the milk. Whisk together until and flour clumps are thoroughly mixed in and bring to a simmer. Simmer for a minute or so until thickened and then stir. Add in pumpkin, salt, pepper, nutmeg, mustard powder and sage. Stir together. Add in the cheese and stir until cheese is melted into the sauce and combined. Pour the cheese sauce over the macaroni and stir together until macaroni is coated. Sprinkle a little pumpkin pie spice over each serving and enjoy. I’m so glad I found your site! A couple nice girls from the WW boards sent me your way. This looks yummy, I can’t wait to make it this week! I made your Chicken Tamale Bake tonight, it was so good! This sounds so comforting and yummy! I’m going to make this tonight for dinner! mac and cheese with pumpkin- yes please! Have you started to think about Thanksgiving muffins yet? Stuffing? Sweet potatoes? Green bean “casserole”? The options are endless!! Haha, I do have stuffing muffins on my list! I will try to get to those soon. I like my green beans straight up (they’re one of my favorite vegetables) but those are awesome suggestions! This is such a great idea! I’ve made mac & cheese with squash before in an effort to boost the flavor and fiber content and loved it. I’m going to assume that I would love this too since I’ve been adding pumpkin to just about everything else as of late. Can’t wait to try! I’m not much into pumpkins but I do love cheese. Wonderful image. That’s what made me decide to try this and no disappointments here! Tasted fantastic. The pumpkin and cheese combo tastes very good. Super delicious and super filling. Yum! Great mouth-feel and lots of flavor. We had rotini pasta, which absorbed more of the sauce, so it looked a little more dry than your picture – but was still nice and creamy. Thank you! This was a great recipe, I will definitely make this again! Your style is unique сompаreԁ to other folkѕ І’ve read stuff from. Thanks for posting when you have the opportunity, Guess I will just bookmark this blog. THIS WAS FABULOUS! My husband and I were licking our bowls! THANK YOU! This was a brilliant recipe – thanks so much for sharing – will be sharing on my own blog. Added cauliflower to mine to make it go a bit further. I just recently found your blog, and made this for dinner tonight. My husband and four kids loved it…they all had seconds and we all loved this…so tasty! I wonder if this will work with dairy free milk and cheese……? I am so glad I found this recipe! I made it tonight and it was fabulous! I made a small alteration, I just pumped up the mustard and pepper a bit and only after I tasted the sauce. I will definitely add this to my collection of go to, easy recipes. I tried this just now with almond milk and dairy free cheese!!!!!! SO.AMAZING. 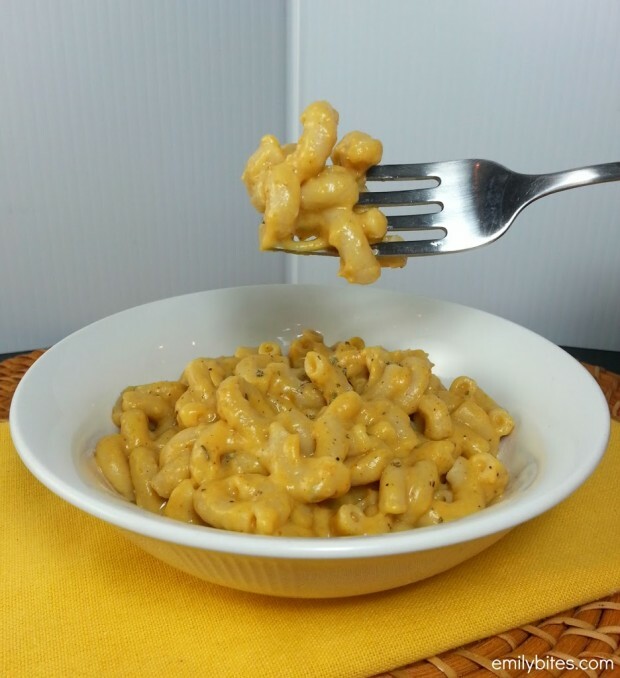 This just might be the Mac and Cheese fix recipe for this dairy free woman! I cannot thank you enough!